They may have trouble walking, but they had no problem flying as about 30 people with multiple sclerosis lined up at Fort Lauderdale Executive Airport for free flights over Broward County. Monday's "Fly for MS" cloud-hopping jaunts were part of a bigger plan to raise public awareness, generate donations and help lift some of the psychological weight of this complex disability off of MS sufferers, if only for 20 minutes. "Fly for MS" volunteer pilots Fouad Ahmed and Tomas Vykruta began their journey in Toronto last week. Fort Lauderdale is the second stop on their tour for the National MS Society. "On this mission we have about 32 cities in 18 countries and we'll cover it over a period of three months," said Ahmed. "We're almost covering every country from North America, South and Central America." 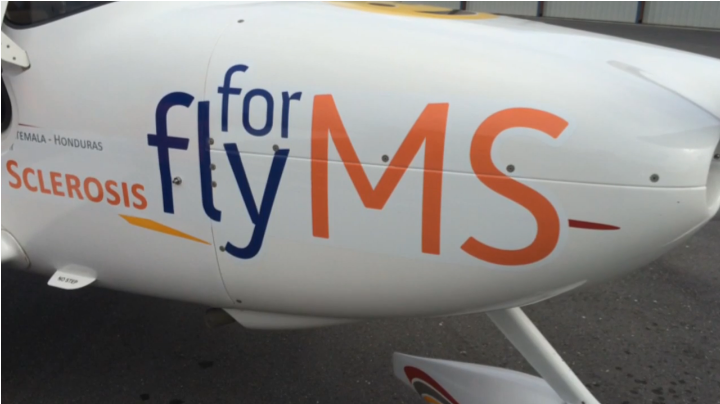 In every city, up to 25 people with MS will take turns flying in single-engine planes for about 20 minutes. Family therapist Hasina Roach, 34, of Lauderdale Lakes, and her 6-year-old son Gianni Guerrier got to fly with Vykruta. "I've had to deal with MS over three years," she said. "There was a time I had a walker, I had a cane, because of the way my health is, it goes up and down." Roach says she copes with her illness for the sake of her son, who has had to grow up quicker than most kids his age. "He wants to help with cooking. He wants to help with cleaning. He helps me with the groceries," she said. "He is very independent, gets himself dressed in the morning, takes his own bath, gets ready for school. I don't have to prompt him. He's a great kid. I'm blessed." Michael Myette has been dealing with MS a lot longer. "I was diagnosed in 1992 after 20 years of them not knowing what it was," he said. "Luckily the MS Society was there for me." In addition to funding research for a cure, the National MS Society provides programs, services and financial help for families dealing with MS, said South Florida chapter president Karen Dresbach. "There are 8,000 people with MS in South Florida," she said. "We get 200 calls a week." Multiple sclerosis is a chronic, progressive disease that damages nerve cell membranes in the brain and spinal cord. Symptoms vary depending on the person but they may include numbness, speech impairment, muscular dysfunction, blurry vision, and extreme exhaustion. There are medications and physical activities that have helped people like U.S. Marine Corps veteran Lanny Carrero, 49, of Palm Beach Gardens. He was diagnosed 28 years ago. "I was 255 pounds and very inactive. For me, being a Marine, it was very difficult," he said. "I've dropped the weight down to 195 now and I'm still cranking out the miles for MS."
Carrero trains by riding his bicycle 15 to 20 miles, three to four times a week and then participates in the Bike MS fundraising ride, logging 150 miles over two days from Fort Lauderdale through the Keys. "I want people to know that being diagnosed with MS is not a death sentence," he said. "It doesn't mean you sit in a chair and stop doing things because there are adaptive sports in everything, adaptive cycling, adaptive fishing, adaptive everything." The next challenge is to overcome cultural barriers, said Yolinda Salgado, 57, of Miami, who was diagnosed 15 years ago but had trouble finding a doctor who could recognize MS and treat it.